The Magic Behind Soccer Speed: How Can Soccer Athletes Get Faster? Blog The Magic Behind Soccer Speed: How Can Soccer Athletes Get Faster? Soccer athletes need speed. Even if you have elite level skills, without speed you will literally be a step behind the competition. Thankfully, speed can be taught, trained and improved significantly. So what can you do to develop this essential skill? What is the magic formula that can help soccer athletes get faster? Let’s start by being clear about exactly what we mean when we’re talking about speed for soccer. 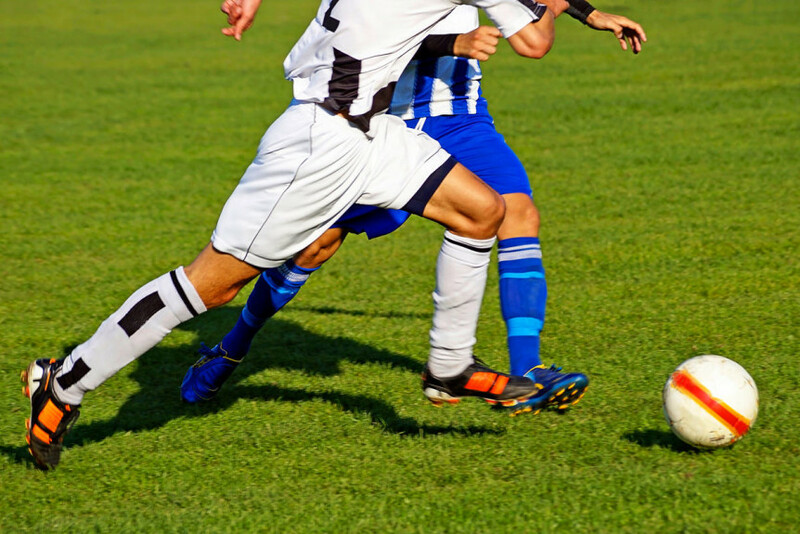 Soccer athletes need to be able to beat their opponents to the ball, out-position and out-maneuver the other team, and react to developing plays. Of course it isn’t just a few bursts and cuts; they need to be able to do this over and over again throughout the game. Many teams train for speed by “running some sprints” at the end of practice. They might even mix in some agility ladders and plyometrics on occasion. While those can all be good tools to develop speed, without an intentional plan and an initial focus on ensuring basic movements are correct, those tactics are unlikely to help the athletes reach their full potential. Think about it from another perspective: If a team was told to line up and just start kicking the ball however feels natural to them – without making sure they had learned and mastered the fundamentals of ball control – they will probably take longer to be able to execute that task at a high level. Anyone can kick a ball, but to control and move with it at a high level requires technical expertise and experience. Believe it or not, the same goes for running fast. If attention isn’t paid to how the athletes are moving, accelerating, slowing down, changing direction, and running at top speed they are probably going to be moving less efficiently than they could be and likely not seeing the speed that they could see. Part of our mission at Champion Sports Performance is to let athletes and coaches know that it doesn’t have to (and shouldn’t!) be that way. Since speed is recognized as a key attribute of high level soccer athletes, we want to help them train smarter – not just harder. You can make significant improvements by more intentionally targeting and training the different aspects of player speed that can make a big difference during games. For athletes to unlock their soccer speed, they should target each aspect of speed that will help them during each game. By breaking down speed training into discrete components, we can discover the magic formula behind soccer speed. When most people think about speed, top speed is what they picture: an athlete moving at their maximum velocity. There are many factors that can help increase an athlete’s top speed such as proper mechanics, strength, and the endurance to maintain their top speed without fading. This one is pretty obvious: If you want to run past defenders – or keep opponents from leaving you in their dust – you need to aim for a higher top-end speed than they have. Speed endurance comes into play here as well, which will influence how long you’re able to maintain that top speed before you start to fade. Acceleration is all about getting yourself up to top speed. Whether you’re starting from a standing position or you’re already on the move, you need to be able to get up to your top speed as quickly and efficiently as possible. Often, athletes are so focused on trying to run fast that they forget about accelerating efficiently. That means they are probably rushing their acceleration – which actually limits how quickly and explosively they can get up to top speed. Athletes that can accelerate quickly can effectively gain a step or more as a head start over opponents who haven’t trained to accelerate optimally. As mentioned above, an athlete’s acceleration mechanics, technique, and power come into play from both static (standing still) and dynamic (moving) starts. During a game, players will usually be moving as they track a developing play and then recognize when it is time to turn on the jets and beat their opponent or get to the ball. Soccer athletes need to be able to take off quickly, efficiently, and explosively from a variety of starting speeds and in varied directions. When the proper strength and technique are applied together, it is like having a head start against your opponent. In this case, we’re talking about slowing down on purpose. Athletes need to specifically train deceleration so that they can stop on a dime. Without proper deceleration mechanics – and the strength to handle those deceleration forces – athletes are exposed to greater injury risks such as knee and ankle injuries. Also, if you improve your ability to decelerate rapidly, you can spend more time at full speed and less time slowing down. Just as improving acceleration can give you a head start at the beginning of an encounter, developing deceleration strength and skills can give you an extra edge over your opponent as you approach the ball, defender, or line. Agility is the ability to change direction and adjust your speed of movement. Agility requires rapid application of both acceleration and deceleration to slam on the brakes, change directions and re-accelerate. An athlete that demonstrates great agility can avoid an all-out footrace altogether by using deceptive movements and cuts to send their opponent in the wrong direction. Agility will also allow you to make adjustments on the fly to better react to a developing play, incoming ball, or opponent trying to fake you out. As you improve agility and learn to apply acceleration and deceleration together, you can make cuts and changes faster than your opponents are able to respond. Putting it all together: TA-DA! We’ve now covered that soccer speed isn’t just about “running as fast as you can”. There’s more to it than that, and that’s actually a good thing. When athletes engage in a well designed speed training program, they are able to improve in each of the aspects of speed which will help them perform at their best in games. All athletes – even naturally fast runners – can benefit by training and improving their Top speed, Acceleration, Deceleration, and Agility. Put them together and (TA-DA!) you’ve discovered the magic formula. Instead of thinking of speed training in one dimension, this approach ensures that athletes can improve across each of these dimensions. By training each of those aspects of speed that are essential to soccer athletes, you’re on your way to having real soccer speed as an asset and the ability to really use it when it counts. The “TA-DA!” acronym emphasizes the need for developing Top speed, Acceleration, Deceleration, and Agility. While discovering that formula may seem like magic, it is merely the “what” and “why” of speed development. That’s where the magic ends and the hard work begins: putting it into practice with intentional training. If you’re ready to start building true speed through a program that enhances these attributes and more, sign up for one of our training programs today. If you coach a team and you’d like us to help your team train together to develop speed that helps your athletes play at their best, contact us today to start the process of developing a program for you. Champion Sports Performance Open House!